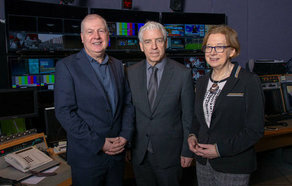 Alan Esslemont Director General TG4, Mícheál Ó hÉanaigh, Chief Executive Údarás na Gaeltachta & Mary Uí Chadhain Financial Controller TG4. A new Media Training Development Scheme has been launched by TG4 and Údarás na Gaeltachta. The aim of the scheme is to support production companies to develop the skills and talent of their production staff and in doing so encouraging an emerging generation of Irish speaking talent to work in the sector. TG4 and Údarás na Gaeltachta are now accepting expressions of interest from Independent Production Companies who are interested in participating in the Media Training Development Scheme. The project is divided into two initiatives, a Work Experience Scheme, aimed at production companies who would like to invest in developing new talent in the sector by giving practical experience to a graduate or new entrant in an area where the company sees a gap in expertise. Skills areas which might be considered could include Editors, Directors, Researchers, Assistant Producers and Production Development Staff. The Upskilling Bursary Scheme is aimed at professionals in the industry who wish to upskill or develop their area of expertise. The bursaries will support specific courses or training initiatives, which lead to general career development. “The nurturing and development of the Irish language audio-visual sector is an integral part of TG4’s strategy. TG4 invests over €23m a year in the independent sector and an important aspect in growing the sector is the fostering of a highly skilled workforce, who will in turn bolster the production and creative industries, particularly in the regions”. “We are delighted to be working on this scheme in collaboration with TG4 and the independent production sector. Údarás na Gaeltachta has played a central role in the development of the creative digital industries for many years and we are hopeful that this innovative and dynamic scheme will significantly enhance the stream of talent and new skills coming to the fore in the Irish language audio-visual and digital media spheres in 2019. This initiative complements the Údarás’ strategy of supporting the development of training programmes and education to increase the level of skills and employability in the Gaeltacht”. TG4 and Údarás na Gaeltachta will both be making a significant investment of €160,000 each in this pilot scheme, in addition to the input from the independent sector which will create training and employment opportunities.